This rising penetration of financial products and services will, according to Ross Teverson Head of Strategy, Emerging Markets, forge dramatic change in developing regions of the world, in turn creating opportunities for investors. Nearly half of the world’s working-age population is considered ‘unbanked’, with no access to even a simple current account. However, technology is not only starting to close this ‘banking gap’, but also empowering emerging and frontier markets to leapfrog their developed counterparts. This rising penetration of financial products and services will, according to Ross Teverson Head of Strategy, Emerging Markets, forge dramatic change in developing regions of the world, in turn creating opportunities for investors. For many, putting their cash in the bank or making use of an overdraft facility is second nature. Yet, for approximately 1.7 billion people across the globe this isn’t the case. In fact, nearly half the world’s working-age population do not have access to a bank account. The disparity is even greater for women, where globally only 65% of women have an account compared with 72% of men. The gap has remained unchanged since 2011. This isn’t a phenomenon that is going unchecked. Governments around the globe are getting behind the effort. According to the World Bank, since 2010 more than 55 countries have made commitments to financial inclusion, and more than 30 have either launched or are developing a national strategy. However, there is still a long way to go. Low banking penetration is, for the most part, a developing world problem. 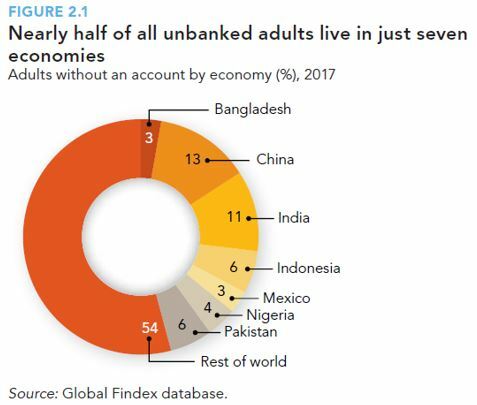 Nearly half the world’s unbanked population live in seven countries: China, India, Pakistan, Indonesia, Nigeria, Mexico and Bangladesh. Technology though is driving financial inclusion, allowing people in even the remotest regions to access financial products without the need for physical branches. As internet accessibility and mobile technology accelerates, financial inclusion should improve in tandem. This is evidenced by the fact that 52% of adults have sent or received a digital payment in the past year, up from 42% in 2014. It is clear in our view that financial inclusion and indeed the broader formalisation of many emerging market economies is a key theme delivering positive change. Financial business models should benefit from long term structural change such as the transition from cash to digital payments and increasing mobile payments and to benefit from this, we look for companies across frontier and emerging markets where this change is underappreciated by the market. Take Brazil for example: though it is one of the largest emerging economies, these trends are still in nascent stages. Only 32% of Brazilians over the age of 15 had a credit card in 2015 vs 60% in the UK. Cash still accounts for nearly half (48%) of all consumer payments while the UK the figure is much lower (27%) . Companies that we believe can benefit from this development include Itau Unibanco. The firm since listing in 1993 has already demonstrated that it can sustain through downcycles while being highly profitable throughout most periods. Moreover, the banks growth profile is supported by the continued weakness of state banks and a balance sheet which can support further medium-term growth without risk of equity dilution. At a corporate level, the Brazilian bank is becoming progressively more conservative, in so far that it has successfully shifted to a ‘safer’ loan mix – both on the corporate (shift away from SMEs) and individual (higher rated loans) sides. Itau has achieved this while also growing its ROE to more than 24% in the last two quarters and there is room for greater positive long-term structural change from consolidation. The rapid pace of technological advancement is most evident in Sub-Saharan Africa where the percentage of adults with a mobile money account has doubled since 2014, to 21% of adults. According to the Findex, mobile money accounts are particularly widespread in Kenya, where 73% of adults have one, as well as in Uganda and Zimbabwe, where about 50% do . In order to gain exposure to this trend, we hold Kenya Commercial Bank. The proliferation of M-Pesa, a mobile-based money transfer and financing platform is the main driving force behind financial penetration in Kenya and much of Sub-Saharan Africa. Launched in 2007, the platform is now the most successful mobile financial service in the developing world. KCB leverages this burgeoning technology by offering loan and savings accounts with attractive fees and variable payment or savings periods. Of course, financial inclusion extends beyond simple access to a bank account and encompasses more complex financial instruments. Two such examples are pensions and insurance. Both sectors are extremely underpenetrated in Turkey. Only 20% of employees have a workplace pension, but the Turkish government is aiming to improve this statistic. The state is incentivising savings with a 25% top-up and, as a result, the market is growing rapidly, at a 20% compound annual growth rate from a low base. Companies are looking to maximise on this trend, and one such firm is AvivaSA, a pensions and insurance joint venture between UK insurer Aviva and Turkish conglomerate Sabanci. The company is at the convergence of this structural shift toward financial security and we believe the potential for the company to sustain high growth rates is underappreciated by the market. Ultimately, as investors we look for under-researched and underappreciated companies that will benefit from structural change – and we believe that there are many well-managed companies throughout the developing world which could benefit from the major changes that will come with increased financial inclusion. PagSeguro Preliminary Prospectus. January 9, 2018. Page 4.